Enterprise applications are the lifeblood of IT. We rely on them for everything from optimizing manufacturing to tracking customer satisfaction. 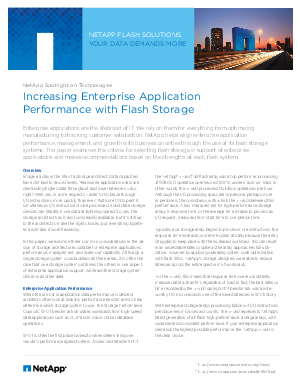 This paper examines the criteria for selecting flash storage in support of enterprise applications and makes recommendations based on the strengths of each flash system. Explore how to align enterprise application performance, management, and growth with business priorities through the use of connected flash storage systems.